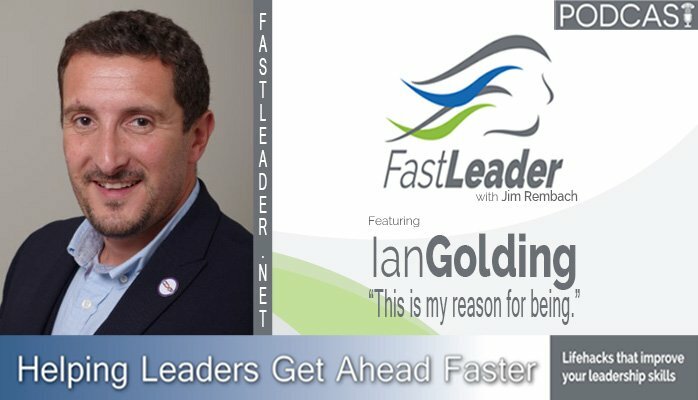 Ian Golding on the Fast Leader Show - Customer What? Ian Golding felt like he beat his head for 15 years working in an organization as a champion for the customer. Over the past 6 years he has traveled to over 60 countries and worked with organizations to help support those that thrive on the customer experience to be heard, recognized and supported. Listen as Ian shares insights on the future of customer experience as a discipline and profession. Ian’s dad is an accountant. For over twenty years, Ian’s dad had aspirations Ian would be become an accountant as well. Ian decided to rebel!! Ian’s dad was also a committed soccer fan. You would imagine that coming from London, he would have been a fan of a world-famous team – like Arsenal. Unfortunately, not only was he an accountant, he is a fan of the mighty Leyton Orient. He’s amazed, he turned out ok, really!! Having obtained a business degree, Ian landed his first job in the financial services industry – the start of a 17-year career in a variety of corporate organizations. In the late nineties, Ian ended up working for GE – a career and life changing experience. Having ultimately, becoming certified as a Lean Six Sigma Master Black Belt, he had the profound realization that every fiber in his body was focused on helping organizations to do the right thing for customers. In 2012, he finally decided to set up his own business – advising, guiding and teaching organizations, about the tools and techniques necessary to turn customer focus into a sustainable reality. In almost six years, he has worked in 37 countries with over 90 different organizations in multiple industries. Ian has also become an avid writer in the subject of Customer Experience, publishing over 400 articles – his first title Customer What? Is sure to be his first of many to come. In 2005, Ian relocated from London to the beautiful Roman city of Chester in the North West of England where he lives with his wife Naomi, three children (Ciara, Caitie and Jack), two dogs and a tortoise!! When he can, Ian runs… a lot… and has completed 28 half marathons and three marathons – one dressed as the pink panther!!! Ian Golding felt like he beat his head for 17 years working in an organization as a champion for the customer. Over the past 6 years he has traveled to over 60 countries and worked with organizations to help support those that thrive on the customer experience to be heard, recognized and supported. Listen as Ian shares insights on the future of customer experience as a discipline and profession. Learn to translate your thoughts in to words. I’m the world’s worst protagonist.